For nearly three decades, the Siddhartha Art Gallery (SAG) has become Kathmandu’s own art installation: hosting the most prestigious art festivals and exhibitions. Synonymous with Siddhartha is its founder, Sangeeta Thapa who gave herself the goal of showing the very best of Nepali art based on merit. Most connoisseurs of art in Nepal and abroad would agree that Thapa has achieved her goal. The past five years have been particularly vibrant for Thapa as she involved herself in diverse projects. Though it hasn’t always been easy in the past 30 years, Thapa has never stopped doing what she likes most. “Inactivity is death,” insists the self-professed workaholic. Her love affair with art began as a child when her father, who was a UN diplomat, took her to shows and exhibitions around the world. “He instilled his love for the arts very early on,” Thapa said in the balmy courtyard of a restored Rana palace outside her gallery. Immersed in this environment, Thapa was determined to become an artist since she was five. Later, she went to the West Sussex School of Arts and Design in UK, but stopped after one year feeling guilty about not following the career path of her father. “The art was just about me,” Thapa says, “but I thought I could serve people as my father did.” She started studying mass communications and anthropology at the George Mason University in Virginia in the USA. But art pulled her back, again. In 1983, Thapa visited many galleries in Kathmandu and felt there was something missing. “The whole production of exhibitions was crying out to be managed better,” she said. While creating her network in Kathmandu, she had the idea of showcasing artists in her own way and opened Siddartha Art Gallery with artist Shashikala Tiwari in 1987. They started exhibiting noted Nepali artists of that time and went back in history of Nepali art to exhibit the works of Nepali masters. After some years of showcasing the same artists, Thapa felt the need to propose more innovative works. “I was seeking new narratives,” she explained, “and I was happy to see young artists in the art community.” The gallery helped launch a new generation of Nepali artists such as Sujan Chitrakar and Ashmina Ranjit. Her biggest challenge was to create an appreciation from the Kathmandu audience for whom the new genre of artwork was not as comprehensible. And while the gallery churned out exhibitions, five years ago Sangeeta set up the Siddhartha Art Foundation to use the medium of art to educate and engage the community. It was during the height of conflict that Siddhartha organised The Open Doors Project which brought artists and citizens from marginalised communities and disparate social backgrounds together in the quest for dialogue and peace. Another project, Shanti: An Art for Hope, involved an exhibition and concert dedicated to the 327 children killed during the conflict. A monument in Sinamangal documenting the names of these 327 children is a testimony of this project. 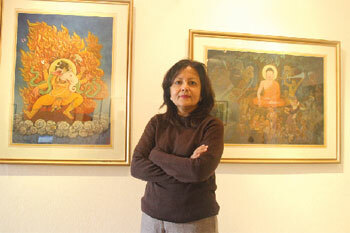 In 2009, Sangeeta Thapa co-founded the Kathmandu Contemporary Art Centre (KCAC), based within the Patan Museum complex. For five years, KCAC has been providing residency spaces for national and visiting artists. The Centre awards scholarships to young Nepali artists who are also given the opportunity to international artists in residency. KCAC has exhibited the works of Nepali artists at the prestigious Royal Overseas League in the UK. Kalajatra is the latest project Sangeeta conceived in June 2013 as an artistic response to the emerging challenges to freedom of expression. Politics, satire and an artistic exploration of the cultural significance of Gaijatra were the prevailing themes of this event which engaged a wide range of participants from Nepal’s arts community. With a grant from the Danish Centre for Culture and Development (CKU), the Siddhartha Art Foundation is currently organising various talk programs on art and curation to encourage the next generation of Nepali art managers. Thapa is preparing for the Kathmandu International Art Festival (KIAF) in March 2016. The first two themes were Status of Women in Nepal and Climate Change, and the next KIAF will focus on the city and urban issues.